I used this spray paint to redo an old refrigerator that had rusty doors. One coat of this spray paint and it looks brand new. I bought this spray paint to touch up a bench I bought at a garage sale and the results were amazing. The store had many different colors to choose from and the color on the cap closely matched the end result color. The project was a little messier than I had expected, but then again this was my first project and I was still a beginner. I next used this spray paint for an item in my son's science project and again the results were great. It gave an overall good coat with minimal dripping and bleeding. The project did require at least 2 coats and I finished it all up with a top coat gloss. The can allows great directional aim and made less of a mess as my first attempt. 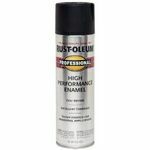 The only complaint I have about this product is the odor, although it is not as bad as many other spray paints I have used. I have a sensitivity to smells and this was a bit strong to me. Other than that, this product works great and seems to have long lasting coverage for many types of materials. I've used it on plastic, glass, metal, and iron items and it always comes out looking amazing. I would suggest though that you apply in thin coats, the results are much better when applies in multiple thin coats. I would recommend this product to others and I'm always looking for ways I can improve the look of home accessories with a fresh coat of paint. This is a popular brand that I have been able to find in many home improvement stores as well as my local dolor store and grocery store. Very easy to find and use! 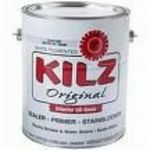 I have used several versions of the Krylon spray paints and have had good experiences with all. Most recently, I used the Fusion version to recolor several plastic windowbox planters for our deck. One con with the paint - it can get messy so use gloves and invest in a trigger sprayer handle to save your finger. It took about 2 coats and some minor touch-ups to turn my terra cotta-colored planters to a nice gray to match our deck furniture. Also used a dark blue to repaint some black terra cotta pots, which did take about 3 coats to cover. So far, the paint seems to be holding up to the sun and rain on both the plastic and the clay planters. It has not flaked off or peeled as I feared it may. Using the Krylon paint was much cheaper than having to buy new planters. 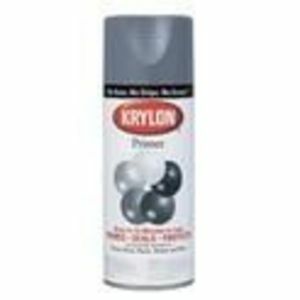 This is a rather generic listing for Krylon's spray paint cans. Some can be used indoors and outdoors and others in their product catalog are one or the other. That's one of the things that you need to keep in mind when you are looking for a specific color. You can use the color samples at the Krylon kiosk to narrow down your color search but ultimately you are going to have to test it out to see how it looks when it dries and if there's any overlapping. A great example of that is their gray series; that has 53 shades to choose from across their product family. This makes it extremely easy to find companion colors in paints, adhesives and primers. When I have used this indoors it's almost always something that is craft related. There is an odor to this so you need adequate ventilation. If you need to do multiple layers for coverage you nee to keep it in the same position as the original layer to prevent warping, rippling, bubbling or over-saturation. Awesome for furnitire revamp projects! Krylon Interior Exterior spray is my favorite spray paint when it comes to sprucing up old furniture. They're are tons of colors available and for a few bucks you can quickly transform tables, chairs and other things for a quick and fairly cheap design change. I have bought many many cans of this awesome spray paint and love that it comes in so many colors. One of my other favorite things about the Krylon Interior/exterior spray paint is that it dries super quick. The spray is easy to use, easy to manage and covers many many different surfaces with ease. It's durable too, doesn't chip easily and sticks to wood, plastic and even canvas. I would really recommend it for anyone looking to spruce up a older piece of furniture or just looking for a good spray paint that is versatile. Quality Great quality. Best bang for the price. Durability Holds up great on many different surfaces. Coverage Best coverage of spray paints. Ease of Appliation Easy to apply and love the non clogging sprayer . 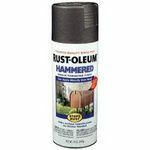 If you are painting a chair, table, lamp, or other small household or outdoor items, this is a great spray paint option. It covers with one coat, it dries quickly, and the spray head is easy to work with. It also comes in a variety of colors, and it has a primer option, so you do not have to sand or work on the item being painted, prior to using the spray paint. Quality This paint is great. It sticks to most materials well. For wood based items, only one coat is necessary. It also goes deeper in to the grain than other spray paints, so you won't have problems with chipping or cracking shortly after painting. 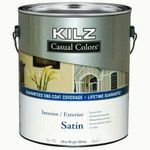 Durability I have painted a few items in the home over the years using this paint. Up to date, all have held out fairly well, with no signs of distress or the paint beginning to fade. Coverage Again, for smaller items it is great. If you are painting a home living room, or other walls in your home, it might not be the best option, as it doesn't stick to walls that well. With smaller items, and home DIY jobs, I find it is one of the best spray paints available. Ease of Appliation No issues with the spray paint bottle. Just push down on the sprayer head, and it creates a smooth, even flow of paint. Oh Krylon, you sure do make life easier! Seriously, the ease with which this spray paint goes on and the smooth coverage that it provides, makes it definitely the best spray paint that I have ever used. Quality The coverage of this stuff is incredible. It provides such a smooth and shiny finish, no dripping like many other spray paints. And it tends to dry quicker than other spray paints I have used as well. Durability Using a spray paint outdoors especially, that lasts a long time, is incredibly important to me. I don't want to be repainting the same thing over and over again. I have found that this brand not only lasts a long time, but it still looks just as good as it did on day one months later. Woo hoo! Coverage Coverage is excellent, smooth, and consistent! No splotchiness, no spots darker or lighter than the rest, only one space coat. I don't think I could get it that good with a brush or a roller even! Ease of Appliation Spray paint in general is pretty easy to use, but when you have a well-designed can it makes it only easier! Love this product! Krylon is probably the most popular spray paint on the market. It is the one I always go to when I need to buy some. My husband and I have used it to repaint our kids outdoor play toys that were sun faded, old furniture, and even on the ground to mark for landscaping. It sprays really evenly and the color always comes out as noted on the can. Our items always look great after using this spray paint and the color lasts a long time. It is very durable and does not come off even when items are left out in the elements. Quality Very high quality spray paint. Anything you use it on will look wonderful. Nice and shiny and coverage is awesome. Durability We have used this to spruce up our kids outdoor play items and it has held up well to the elements. Even a hail storm did nothing to this paint. Coverage Covers really well with very little effort. Ease of Appliation Shake the can up a little and start spraying. I go slow and go up and down so the paint gets on evenly and there are no missed spots. Krylon is my go to brand whenever I need to purchase spray paint for various projects around the house. My most recent project was trying to find a deep green color to spray paint the hinges on my garden gate, as well as the gate itself, so it would match the green fencing around the rest of the garden. I simply could not find a deep green paint that would match until I checked out Krylon's offerings. I found a beautiful forest green and everything was painted that day. 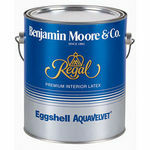 I've found that when painting wood, or almost anything else, I need to apply two thin coats of this particular paint. I apply a thin, even layer, wait for it to dry for an hour or so, and then apply another thin layer. This seems to be the best recipe for streak free, drip free application with excellent coverage. It's always best to use this outside so I usually just take whatever I'm painting and lay it on a piece of cardboard and spray away with no worries about getting it everywhere. It does have excellent control though and does not spit paint everywhere. Overall this is a very, very good spray paint and one of the best available.